Freezing rain and sleet made traveling slick and risky across much of Oklahoma this afternoon. Picture shows an accident south of Stillwater at 56th and S. Perkins Rd. (Highway 177). Everyone in the accident believed to be okay. In Oklahoma City, the precip was heavier with streets coated a solid white. Another round of ice and sleet may come overnight. Fortunately, expected ice accumulation won't be much, around .1". Warming temperatures on Thursday will mean liquid rain in the forecast for the rest of the week. Meanwhile, my weather station is still frozen. Right now, the rivers are about 25 feet above normal. Typically they're around 15', give or take. At the moment, they're just above 40' and estimated to go to about 46-47 feet. I'm not sure that accounts fully for the 5-6" of rain forecast this week. One end of my road is already under water. I have to decide if I need to make a store run before the other end floods and I get stuck for a week or so. Now at 47' and rising. A full 30 feet (plus) above normal. Front section of the road is now covered. Could be a week or more before I can get out. I have a bunch of snow if anyone is interested. WH and chief-david, ya'll be careful. That's a lot of water WH!!!! Well, I ain't got no snow and I definitely don't have that much water but I did get this as a front moved through this morning. Really cool large cloud cover moved over us from the west, slowly darkening the sky to the east. It brought just a bit of rain BUT...the temperature plumetted!!!! 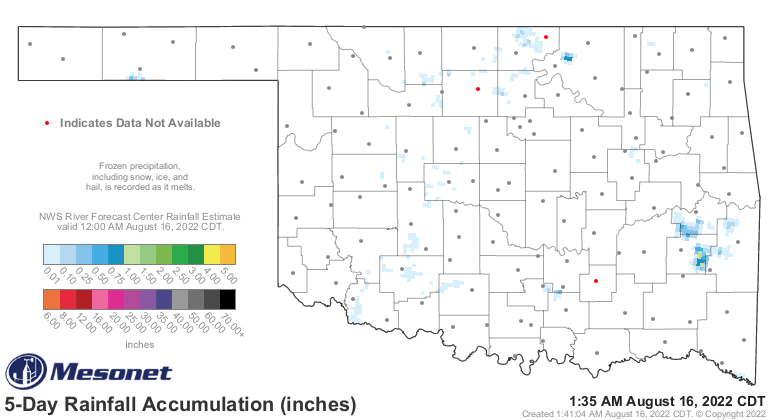 It's rained so much in southeastern Oklahoma that the drought there has likely been broken. Btw, how much do you want for it and is shipping available? The snow is free. The shipping is extra. And expensive! Hmmm. Maybe you've got something there. Take a nice picture of a snow scene close to you and secure some of that snow. Melt it and put it in some small 16oz "recycled" plastic water bottles...the "crunchable" kind would work best to smash into a small flat-rate-box from the USPS. Post an ad with the picture on eBay and advertise it for $14.40 for one pound of snow (A pint's a pound the world around!)...delivered!!! Fix up five bottles and list it as five available. I bet there's some nuts that will buy it!!! Btw, $14.40 would double your money over the cost of the small flat-rate-box expense. Seeing Robins today. Wasn't really paying attention the last few days, so they may have been here. Warm day here in CT. Really hoping this storm Friday brings some much needed snow to the Southern Vermont area. We could use a bit more winter after this warm spell. Forecast now to hit 50' (Major Flood Stage) by March 3rd and stay there until the 7th or 8th. @Weatherhost, you be careful out there and all the best. Did you evacuate? Keep us posted. It is now 6 months since we got hit by Harvey. Wild day on tap for New England. In Southern/Central CT we're looking at wind and rain. I'm seeing gusts up to 25 on my CT station; which is probably a bit conservative due to the way it's sited. In VT, it's snowing for now! I think the wind cups may be blocked. Wind is supposed to pick up there later today. Hoping it stays mostly snow. We need it! Should hold out as snow in the Southern Greens at least. That last storm was very elevation dependent. At our place in VT, we had about 4-5" of snow...then it rained. Snow amounts didn't increase until you got further up in elevation. By the time we got to the mountain we ski at; 12-14" of snow. This next one could really deliver on the snow! Fingers crossed! Snow fell in SE NC last night. This is a rare event for the area, but not something that doesn't happen occasionally. Must be all that liberal warming. LOL The temp dropped like a rock late yesterday afternoon from the upper 40s to low 30s. Coldest winter here in awhile. 91 consecutive days below freezing and it continues over at least next 10 days so 100+ soon. 23 days below zero (-18C) this winter also station record over 4 winters of existence. 27 this morning and I've about had it with this stuff. Hopefully less Ticks and other nasties this year though.